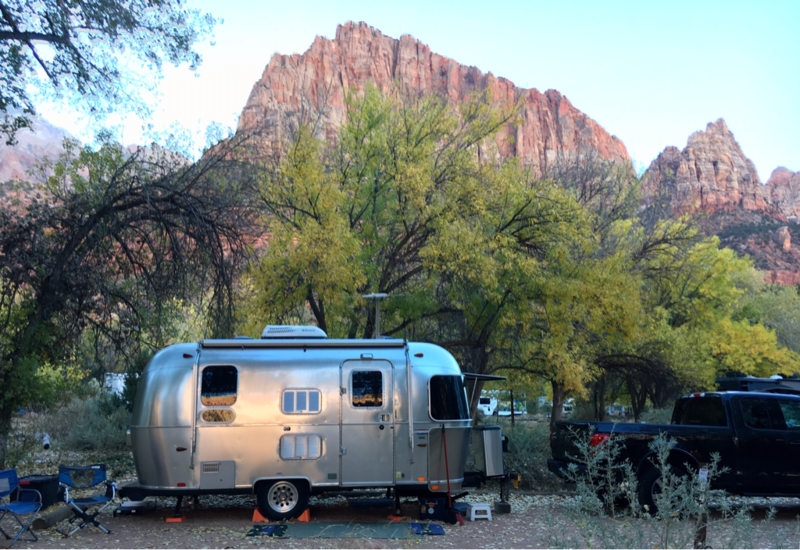 This was our second trip to Zion National Park. 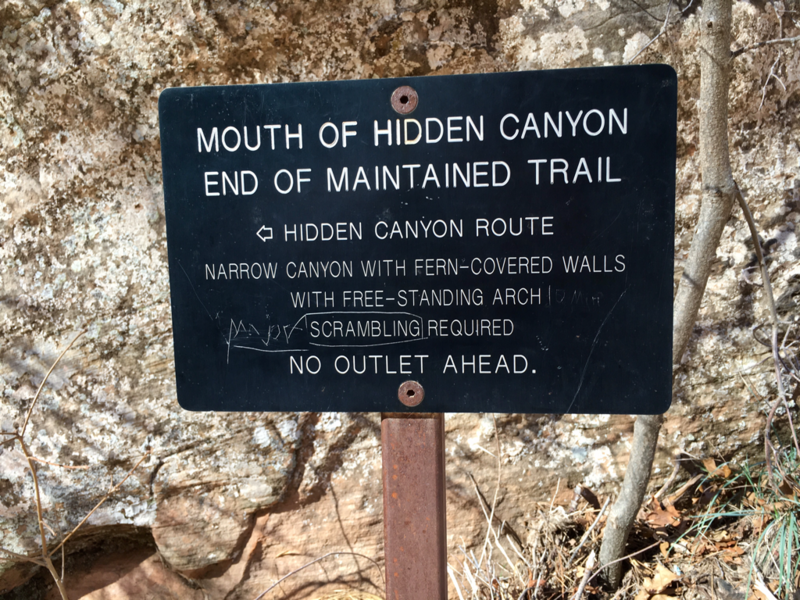 We were anxious to explore the park's trails when there were fewer visitors. 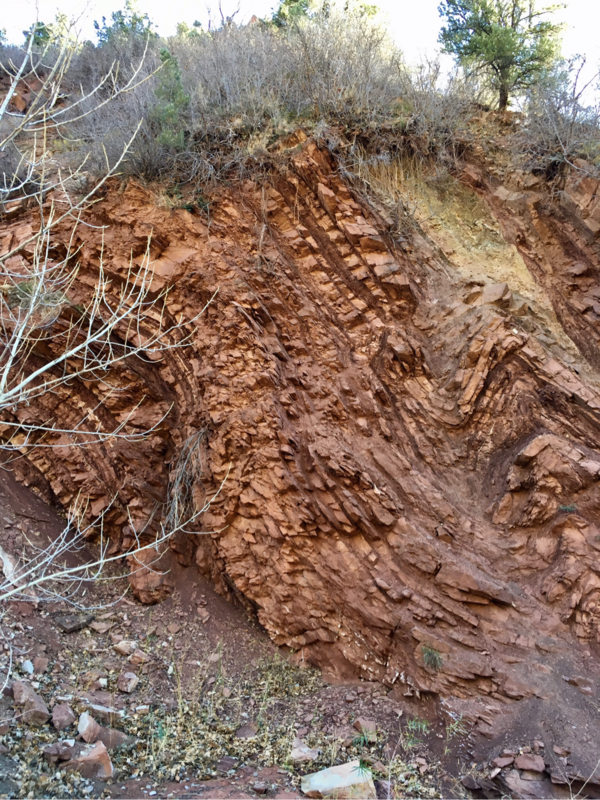 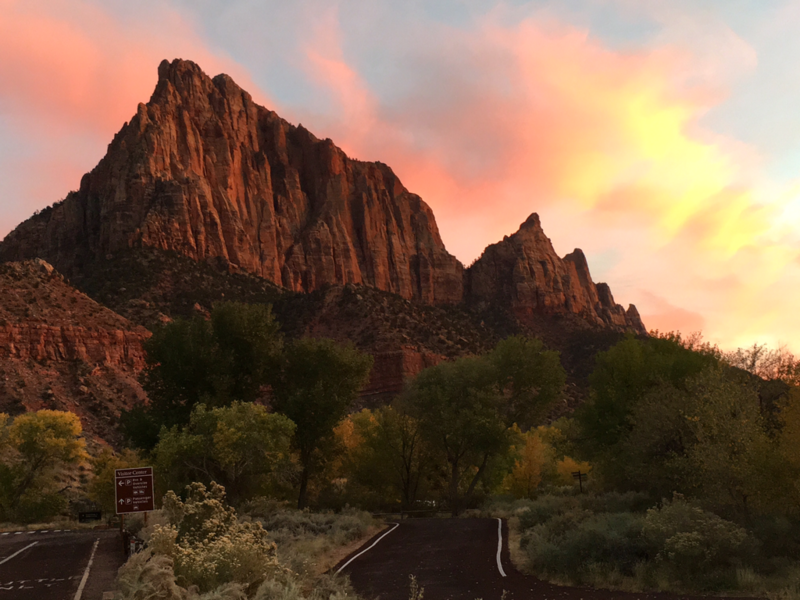 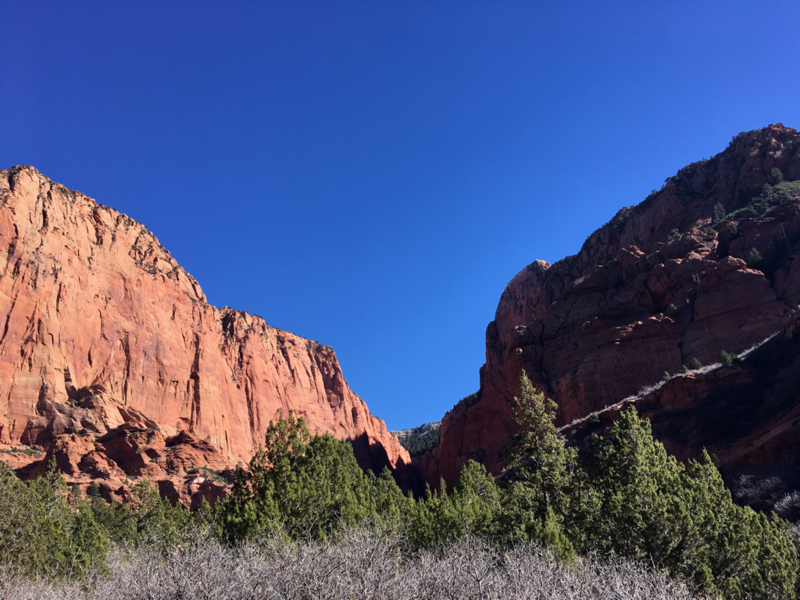 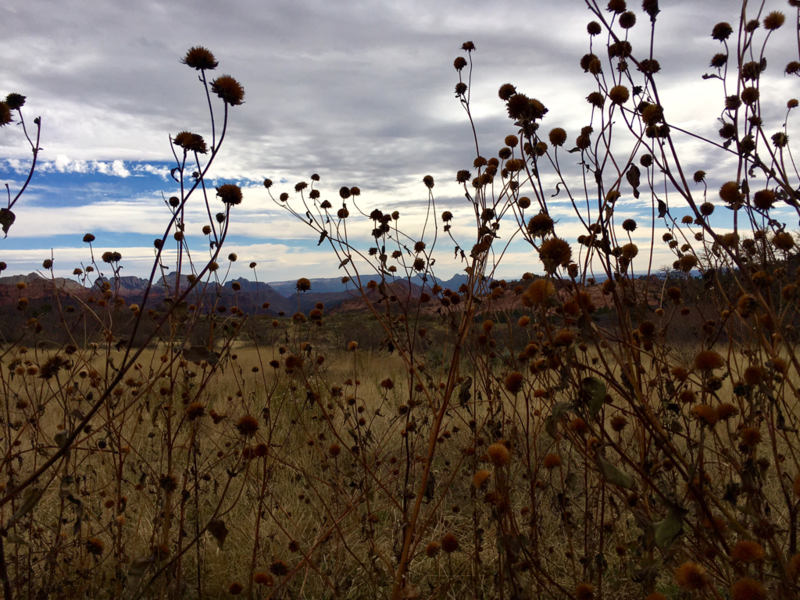 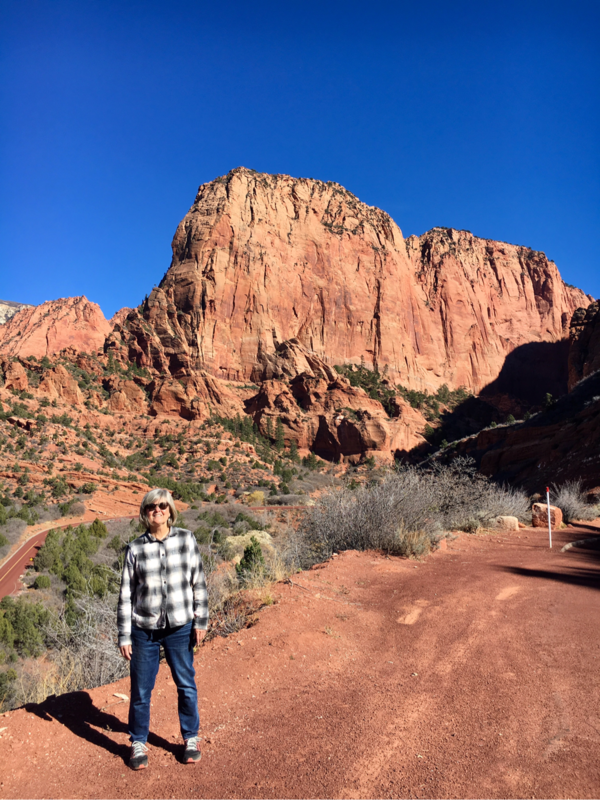 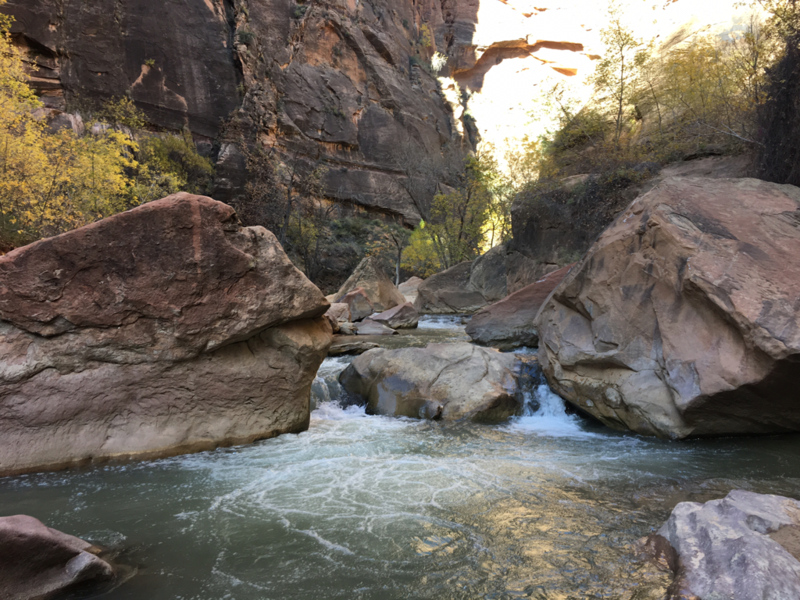 The weather was beautiful and we settled in for a few days of hiking the canyons and biking on the paved Pa'rus multi-use trail that runs two miles from the campground to the junction of the upper canyon. 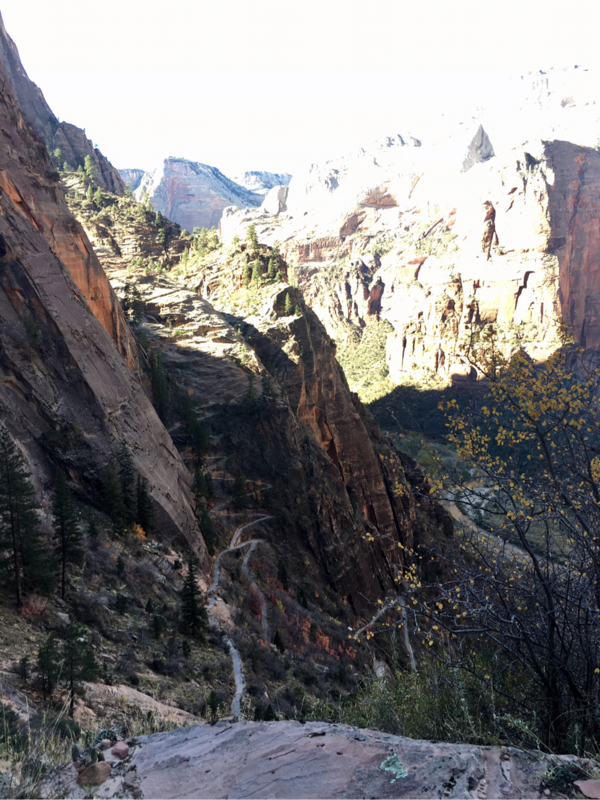 If you look carefully, you can make out the trail as it climbs up a cliff side with lots of switchbacks. 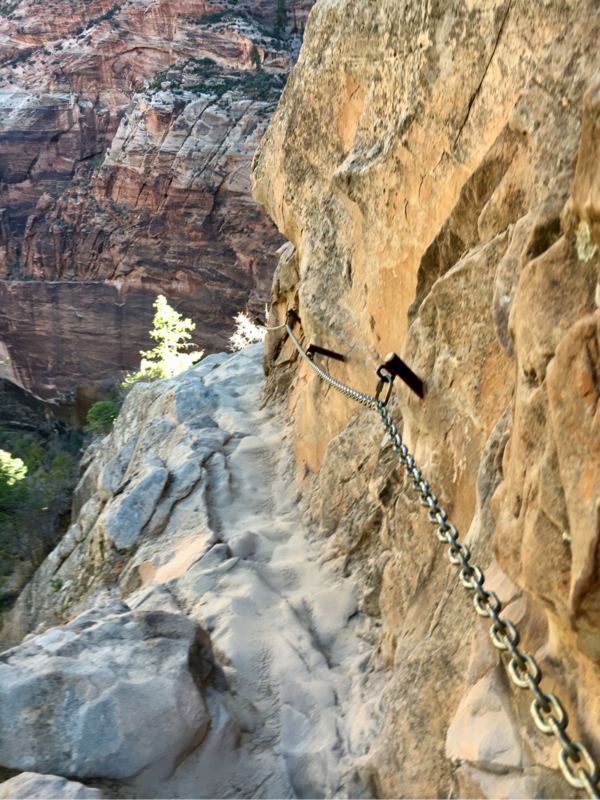 It eventually comes to a narrow ledge that you have to work your way across with the help of chains. 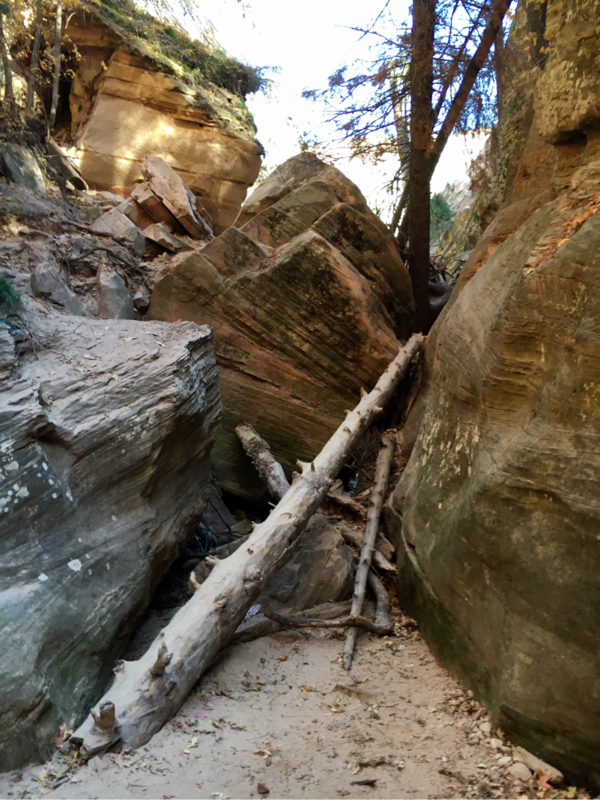 It was at this point that Pat bailed on Hidden Canyon Trail. 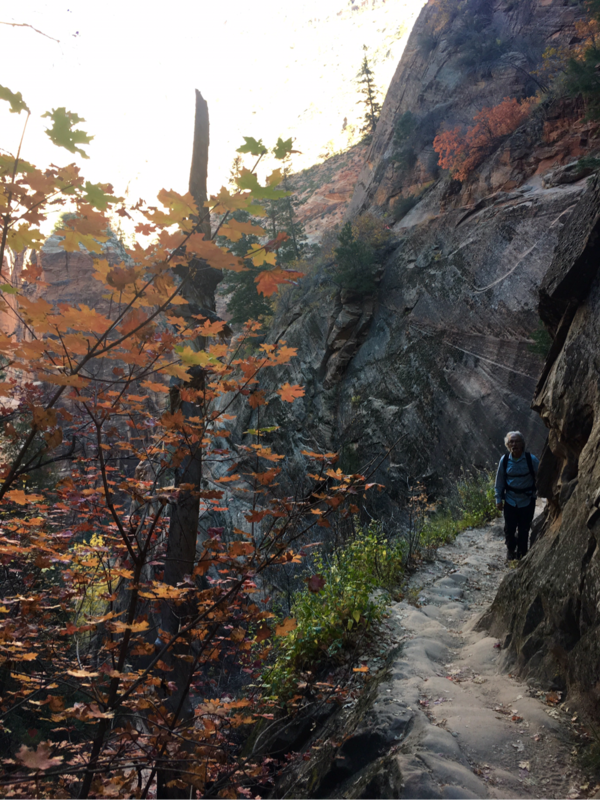 Shelly continued along the Hidden Canyon trail and Pat retreated down to the fork of East Rim trail with plans to meet in the parking lot. 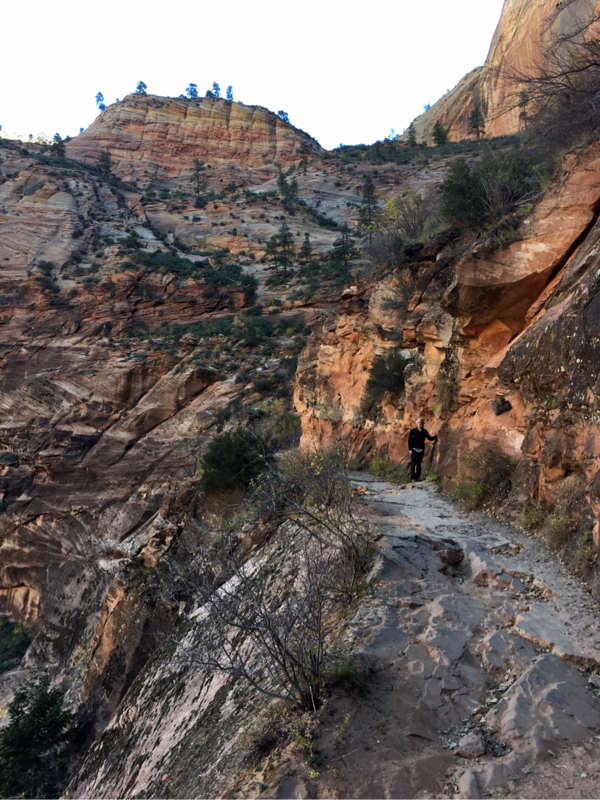 Both trails had great views of the canyon below. 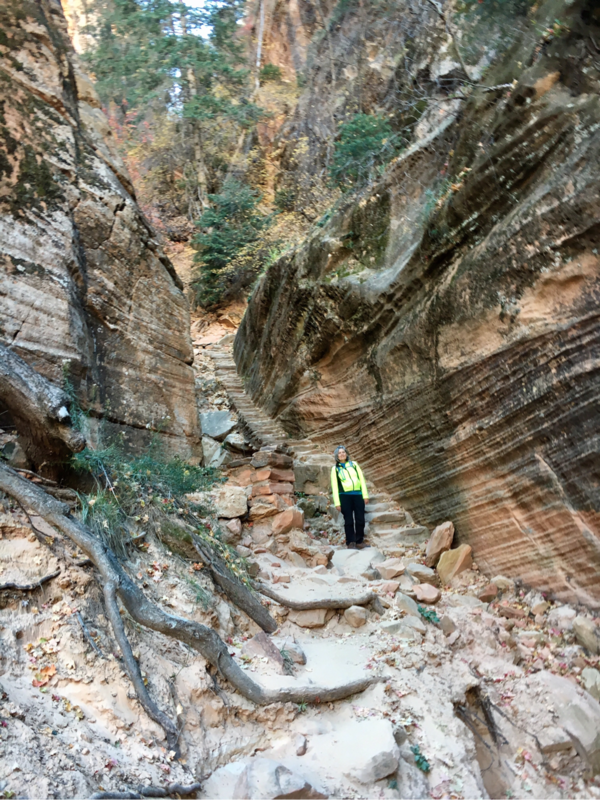 Pat found a pretty slot canyon on hers. 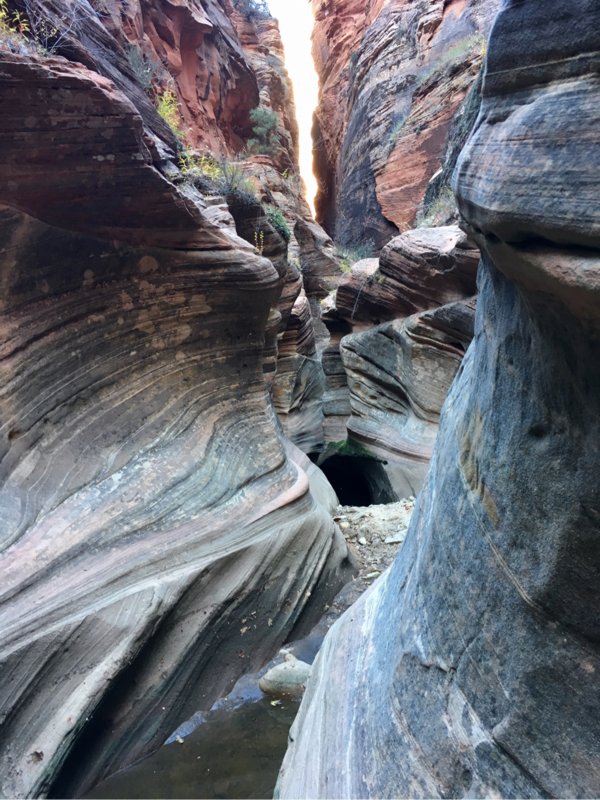 Shelly loved the thrill of the narrow ledges but was underwhelmed with the canyon itself. 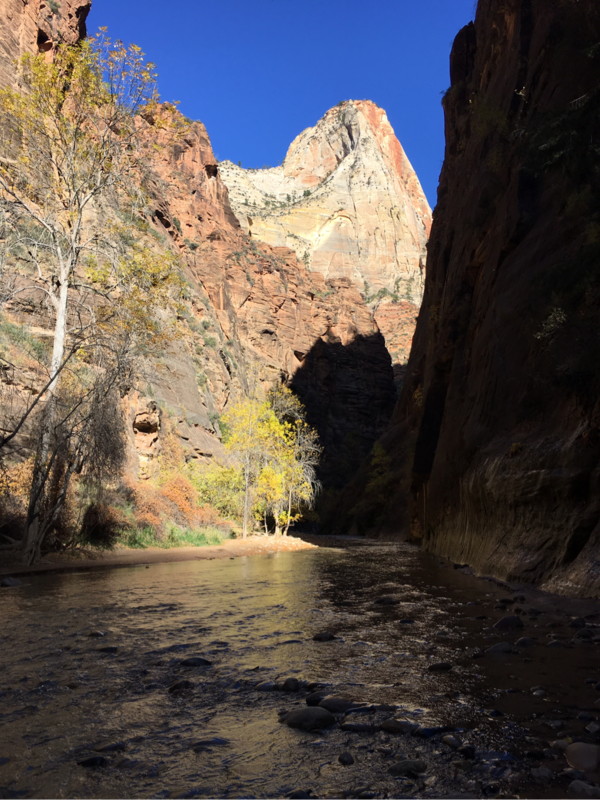 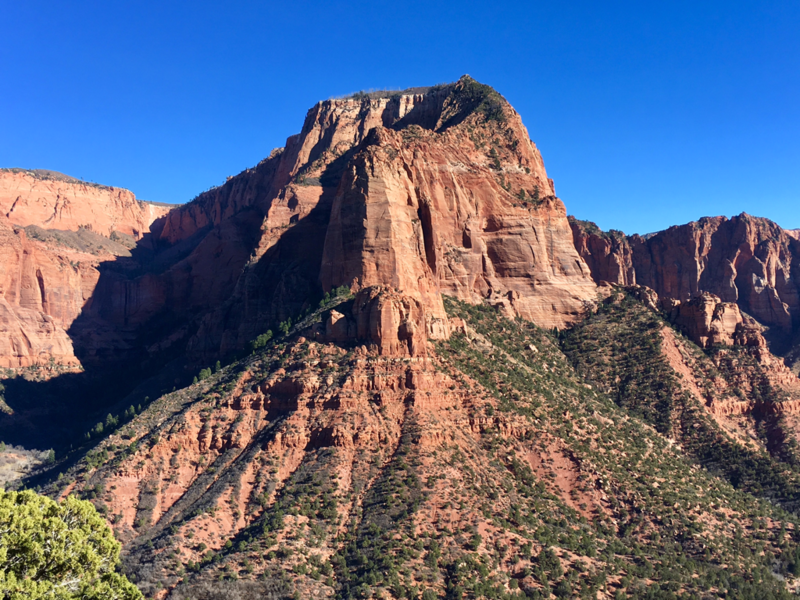 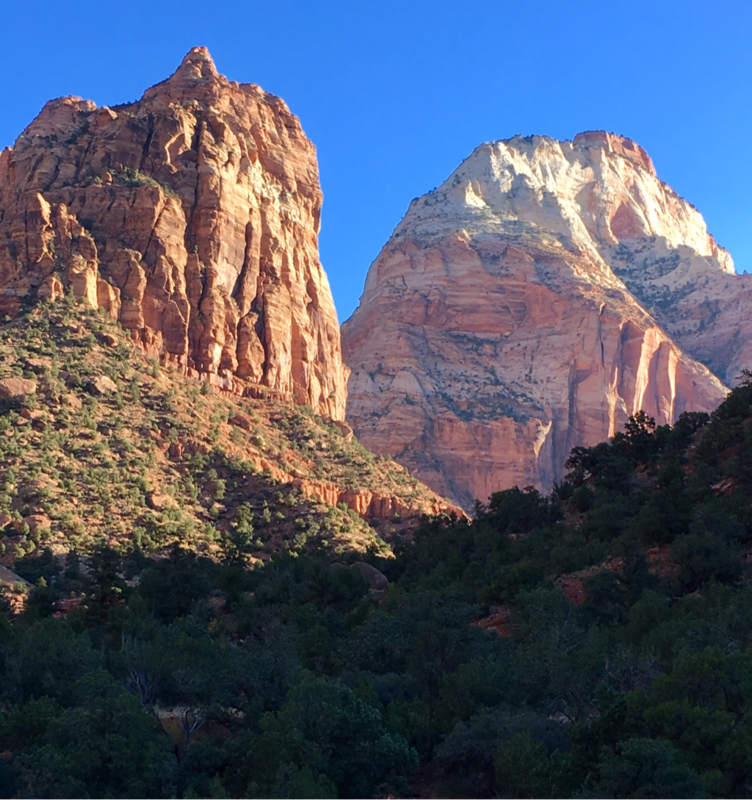 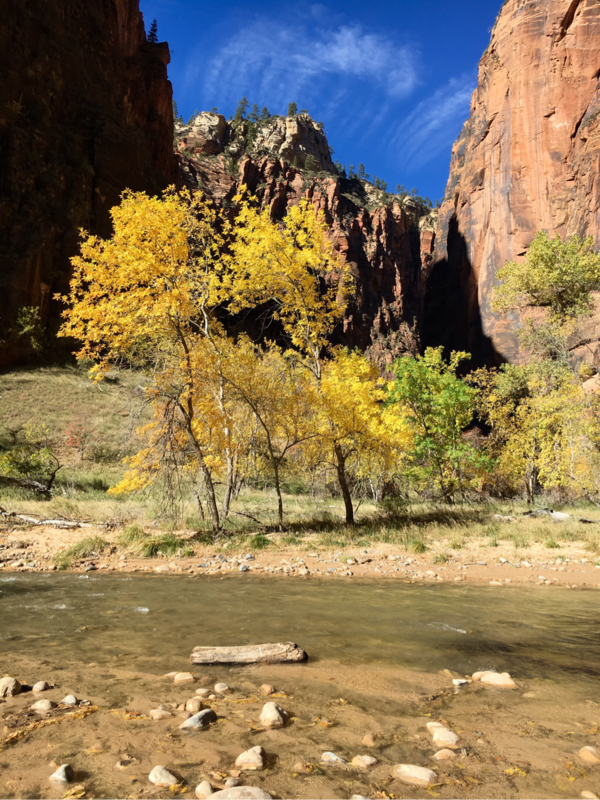 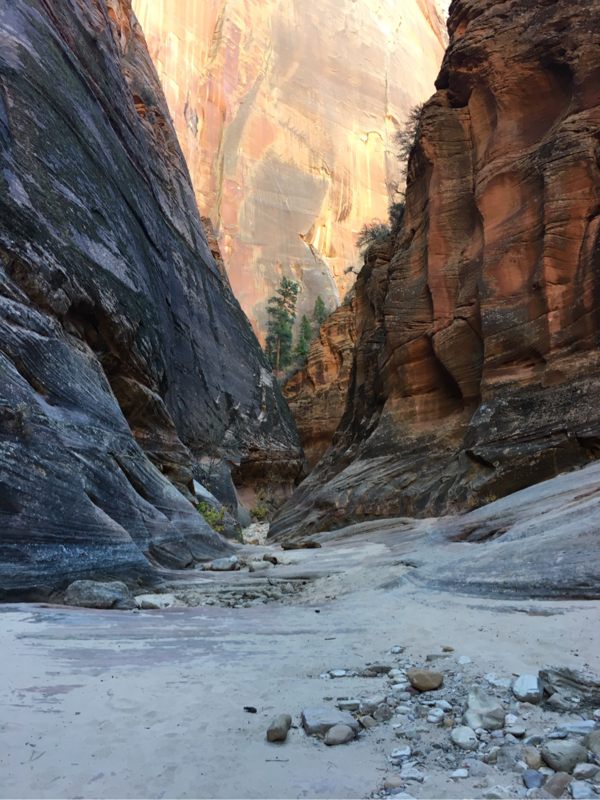 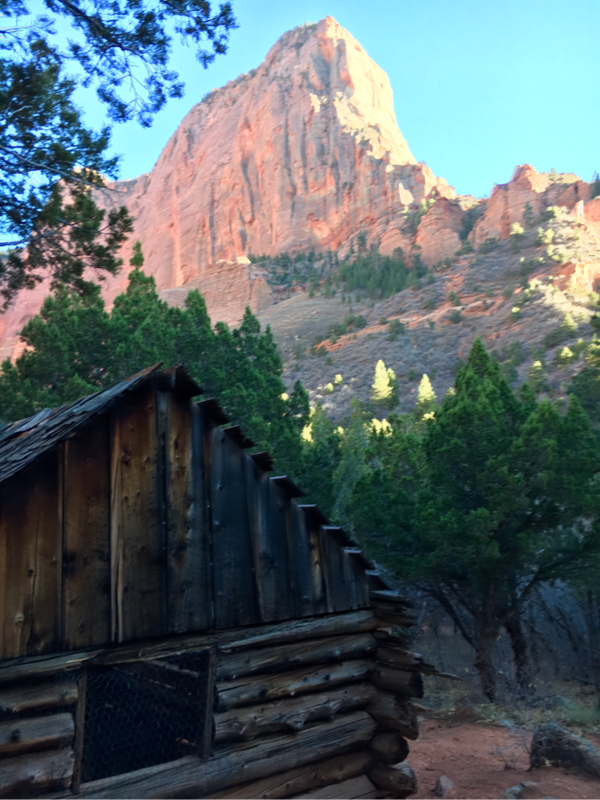 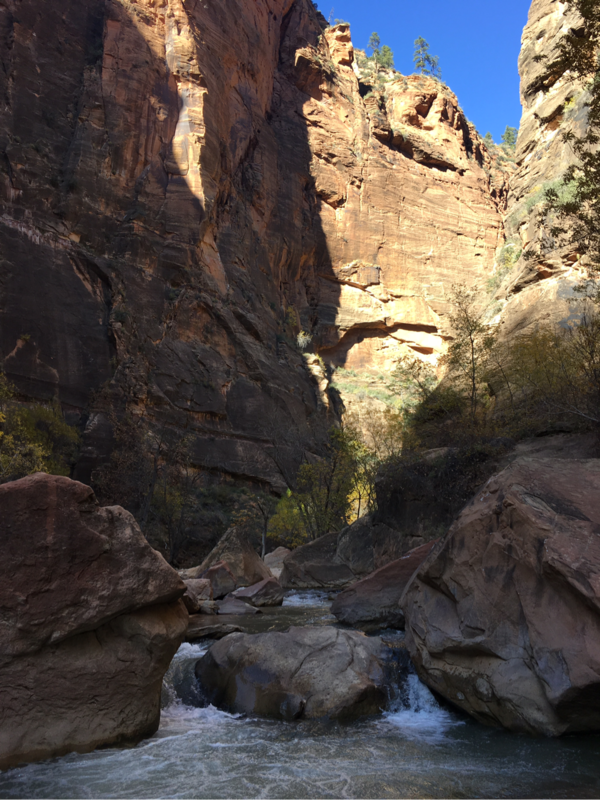 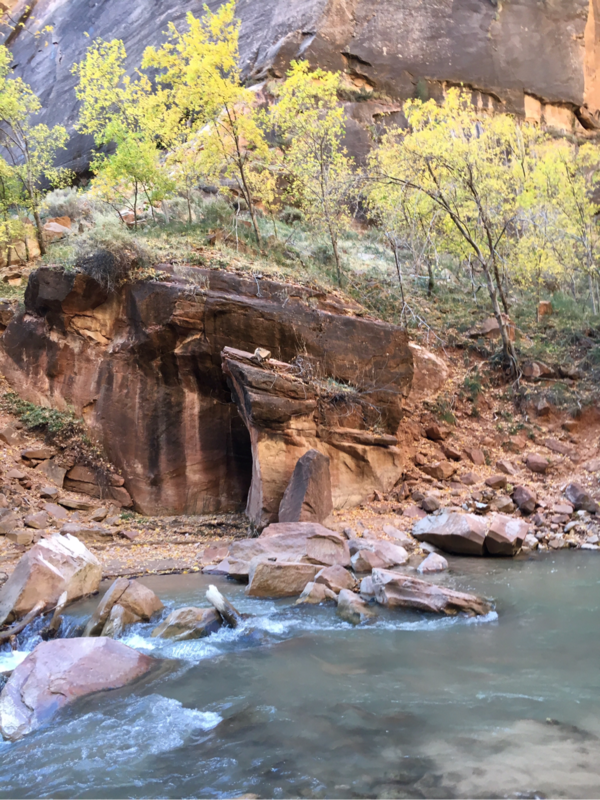 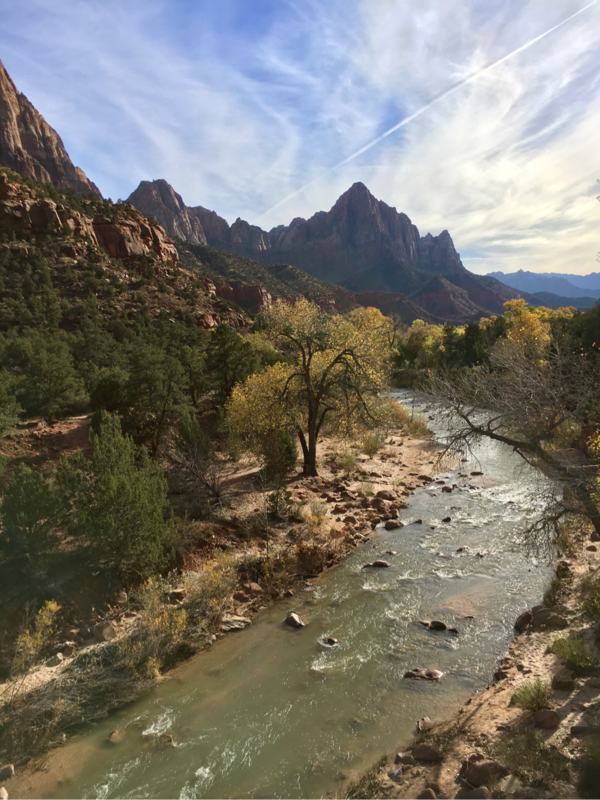 One of the most famous hikes in Zion is the Narrows- it involves walking through knee deep water and is reported to be life changing. 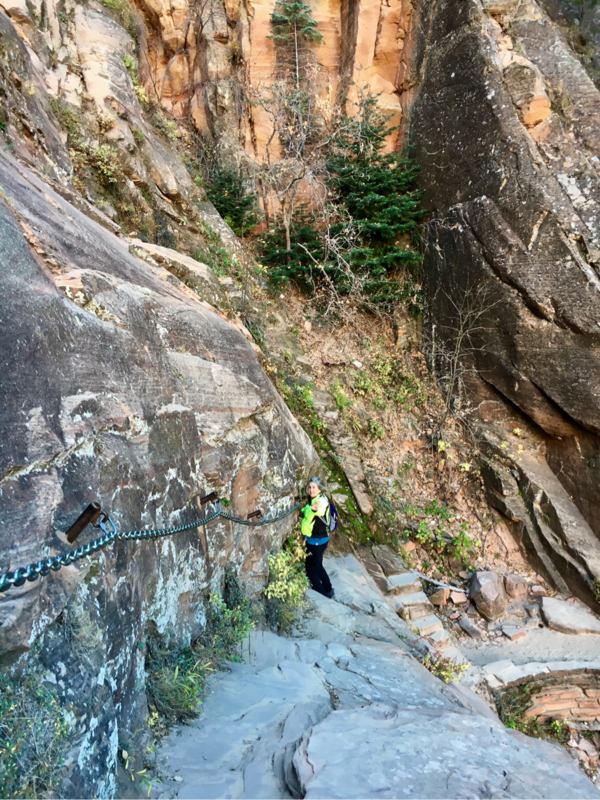 We didn't hike it though -too cold this time- too crowded the last time. 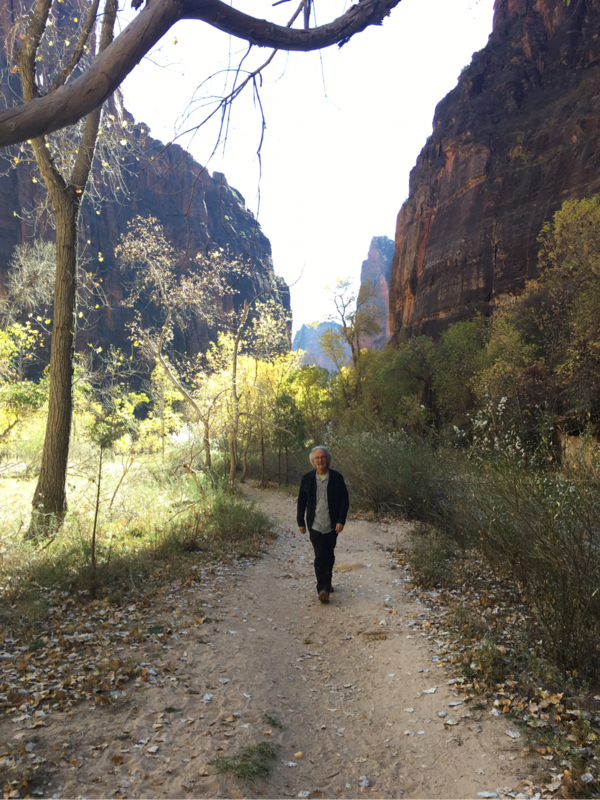 But we did enjoy walking along the river to the Narrows trailhead. 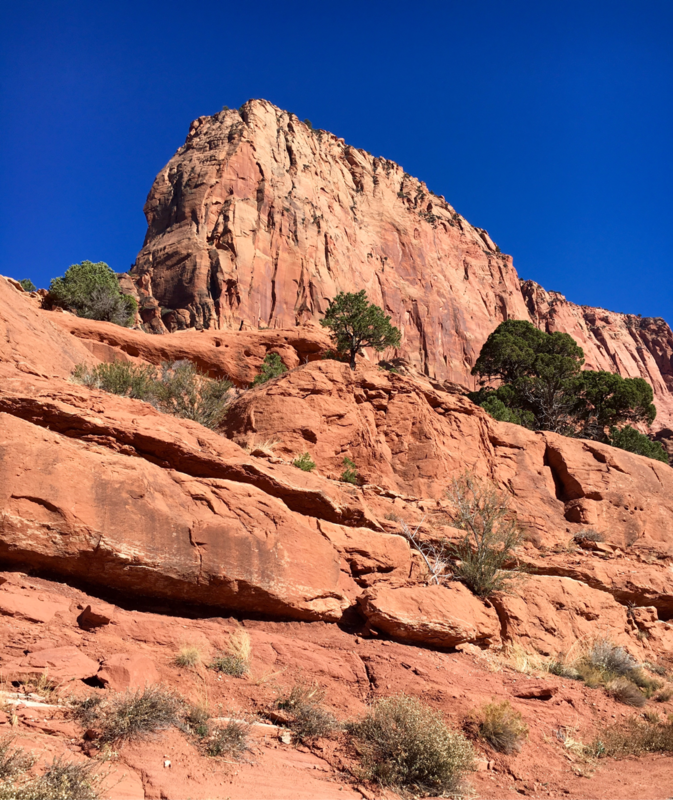 One afternoon we drove to the north section of the park and hiked along a small creek though a red rock "finger" canyon.